Gentlemen of Leisure: X-amining X-Men 2099 #2 - Patreon First! Xi'an's condition worsens as the X-Men search for evidence he was framed for Synge's death. Xi'an's X-Men race away from Nuevo Sol, pursued by the Synge Casino enforcers. They receive an unexpected assist from Bloodhawk, who helps fight off the enforcers and takes the X-Men to a secure location, saying his debt to Xi'an for freeing him from Synge is complete. Back at Nuevo Sol, Lytton Synge admonishes Junkpile for the botched assassination of Xi'an, ordering him to finish the job. Later, a drunk Desdemona crashes her father's memorial service, reminding Lytton she now owns equal shares in the casino. Elsewhere, with the injured Xi'an mysteriously being covered by a cocoon-like red carapace, the X-Men split up, with Meanstreak, Krystalin & Metalhead heading to Synge's casino in order to find evidence that Xi'an was framed for Synge's murder. After they leave, Junkpile tracks down the remaining X-Men guard Xi'an. At the casino, Meanstreak & Metalhead are captured by the Rat Pack, while Junkpile makes short work of Cerebra, Tim and Tina, only to discover Xi'an fully encased in his cocoon. What to read the rest? Become a patron via Patreon! I don’t know the others feel about it, but I never liked the series. In fact, I never liked the 2099 universe. It had little connection with the present-day universe, and it became an excuse to see a 2099 version of every character. I remember reading a few Spider-man issues, and only because I loved Rick Leonardi’s art (I never see anyone else speaking well of him, which probably makes me the only fan of his). From what I've read, it sounds like the 2099 universe was fairly popular, at least in terms of sales. It more or less came apart when Marvel, in the throes of their pre-bankruptcy flailing about, fired editor Joey Cavalieri, who oversaw the entire line. This led to most of the 2099 creators (most of whom were still the original creators who launched the various series) to quit in solidarity. So Marvel had to scramble to bring in new creators to keep the series going, and the audience more or less abandoned the books as a result. But even Spider-Man 2099, which was always the best seller of the bunch, was doing fine sales-wise when the line collapsed, so I think part of its demise can be attributed to just the general state of Marvel (poor) in the mid 90s. As for Leonardi, I've become a fan. I didn't like him as much as a kid, largely because I only ever encountered him as a fill-in artist (and I hated fill-in artists even if, objectively, their work was better than the regular artist's), but as I've gotten older, I've really come to appreciate his work. I want to check out Spider-Man 2099 sometime, in part because of Leonardi. I bought hard into 2099 back in the day. We got the early runs of both Spider-Man 2099 and Ghost Rider 2099 published for us, and even a taster of Punisher 2099. The main characters and supporting cast being fully their own thing and only piggybacking with the regular Marvel character names was done with great success. Smart choice by our publisher to drop the line at the creator change though: the stylistic whiplash in the whole settings was harsh now that I've afterwards seen where the books went from there. You certainly should check out Spider-Man 2099 also because of David. Fun reversal in the character: "Spider-Man" is quite serious in his doings, while Miguel O'Hara is relentless quipper. The various attempts at [classic Spider villain] 2099 obviously maybe let wanting, but The Fall of the Hammer was much better attempt at an 90's imprint specific crossover than what the Midnight Sons imprint managed to deliver. I am quite a fan of the 2099 Universe. It started out incredibly strong. The fact that it held very little connection to the wider Marvel Universe was part of the strengths of the line. It took place in a world where superheroes didn't exist anymore. Yes, things did get diluted as the series progressed (especially after the firing of Cavaleri, as Austin pointed out). However, it still added compelling books to the line, like Ghost Rider 2099, which was one of the strongest books in the line. I would definitely praise the line. There were a lot of very strong creators associated with the original launch of the books. 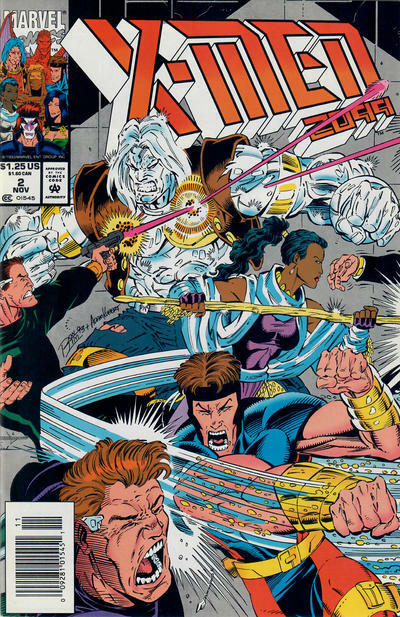 X-Men 2099 was one of the weaker books, but I still found it a worthwhile read. There are certainly books to skip. Hulk 2099 served no purpose. X-Nation was a mess. Fantastic Four 2099 was absolutely awful. Yup, Ghost Rider 2099 was a fun cyberpunk ripoff job by Marvel Comics. Only now I realized what's been scraping me subconsciously all these years: Leonardi-drawn system peacekeeper goons of The Public Eye are somehow very reminiscent of the Genoshan Magistrates of the original Genosha story arc also drawn (half) by Leonardi. I heard the same thing about sales & the mass creator exodus as Austin, but I've never heard it confirmed or denied in any manner. I can understand why - no one wants to step on any toes - but if you look at the books, you can find some evidence. It definitely did feel like the books & the universe started from working from an overarching plan that allowed for the individual books to still do their own things, but once Cavalieri left, the threads started to fray. I liked this book when it first started (I distinctly remember buying the first three issues at a shop in Baltimore to read on vacation), but by the time Halloween Jack shows up, it lost me. It was just as well, since by then the newsstand I used had dropped most of the ancillary X-books (mostly to make room for more DC books, which led to me getting into Flash & Impulse). My favorite ever fiction-in-the-fiction still must be the "Samsa, N.Y.P.D. ", a tv-show the trailer of which was featured in one issue of GHOST RIDER 2099. One day, Greg Samsa, a NYPD policeman, wakes up to find himself transformed into a giant insect. Then he continues to fight crime with his grouchy partner Frank Kafka.